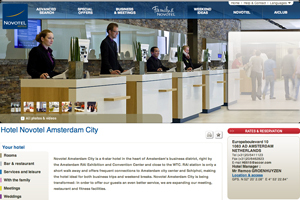 Novotel Amsterdam City is set to complete a full refurbishment in February 2010. The 610-room four-star hotel offers a gym, wellness centre and event space for 1,000 delegates. Sofitel Amsterdam the Grand, also in Amsterdam, is set to complete its refurbishment in May 2010, and will offer a restaurant with a raw food bar, 177 rooms and 19 event spaces, the largest of which has capacity for 328 delegates.